Industry watchers are sitting up and paying close attention to the case because for a long time, the question of unclear provenance has not been looked closely into, and museum directors find it easier – and something given leeway to – turn a blind eye. John Russell is a professor of art history and archaeology at the Massachusetts College of Art and vice president of the Archaeological Institute of America. 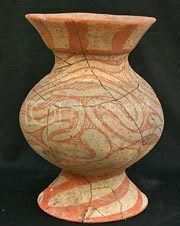 He said the research value of artifacts plummets when the provenance is lost or tainted because knowing the archaeological context of a piece can tell researchers as much about a culture as the artifact itself. He called the Southern California case â€œthe tip of the icebergâ€ and said he and other scholars are watching closely because they hope the investigation helps clean up the industry. Last week, at least two Ban Chiang antiquities were being auctioned on eBay. The high bid for an ancient bowl stood at $27; the opening price for a bronze bracelet was $299. Such transactions are against the law, said the Thai government and U.S. officials. Federal agents monitor Web-based auctions, which can lead them to major dealers illegally trading artifacts. – The Ethics of Collecting Cultural Property : Whose Culture? Whose Property?